I’m going to be that guy. I’m going to be the guy who has definitely complained about Game of Thrones’ glacial pace in prior seasons, and now the absolute rocket-ship that is “Eastwatch.” Let’s take a moment to run down some of the major events, shall we? Bronn and Jaime live! The Tarlys don’t! Jaime’s back in King’s Landing! Cersei’s pregnant! Jon booped a dragon! Jorah’s back! Jorah’s gone! Davos and Tyrion sneak into King’s Landing! Tyrion meets with Jaime! Gendry’s back! Everyone back to Dragonstone! Sam leaves the maesters! Jon, Jorah and Gendry join forces with Tormund, The Hound and The Brotherhood to go a-wight-huntin’ north of The Wall! Hot crackers, this episode got around. As far as picking up from last week’s “Spoils of War” spectacle, “Eastwatch” serves as stark (heh) reminder that Game of Thrones can either concentrate on singular set pieces to spectacular effect, or cram as many significant events as possible in one hour. I mentioned last week that Season 7 has the odd task of balancing the importance of Daenerys and Cersei’s war with the one to supplant it, and you can feel “Eastwatch” working overtime to keep every plate spinning into the final two hours. Sam leaving* the Citadel is probably as naked an admission you can get that there’s no value in keeping storylines separate anymore. The flip side of having to consolidate all those pieces leaves you with stories like Arya and Sansa bickering over Jon’s absence, or spying on Littlefinger; probably building further consolidation with the exit of a superfluous character, but in practice just giving Maisie Williams and Sophie Turner something to do at Winterfell. *We’re of course keeping score of Jon’s Targaryen heritage with moments like Drogon taking a shine to him, but it’s especially odd of Game of Thrones to drop such monumental exposition as Rhaegar Targaryen annulling his marriage to marry another without anyone (especially Sam) realizing its significance. Perhaps it could suddenly click for him later? Still, even as “Eastwatch” kept the war in focus with Tyrion’s apprehension of Dany’s cruelty or Cersei realizing the need for a more Tywin-esque political strategy, the decision to capture a wight north of The Wall is probably our first real step toward the series’ endgame. Dress battles up in dragonfire all you like, these wars are pretty well moot. Putting together a team of misfit toys from across the series to capture a (literal) Game-changing revelation is far more interesting than waiting for Dany and Drogon to burn their next Lannister army. And brisk though the hour was, I’d be remiss not to mention a few moments like Peter Dinklage and Nikolaj Coster-Waldau making an absolute meal of Tyrion and Jaime’s brief reunion, or the Jon-Daenerys chemistry leaping offscreen to smack all your aunts and nephews. Other bits like Gendry’s long-awaited return might be the ultimate example of fan-service the narrative could absolutely have done without, but I’ll grant that the unique symmetry of Robert and Ned (cough)’s bastards joining forces had a nice shine to it. Season 7 is definitely all over the place in terms of structure, and I have actual whiplash from the amount of information and shocking developments “Eastwatch” threw at us. I imagine the final two hours will have a much tighter focus as the Fellowship of the Wight ventures north, and gods know how many more reunions and trips across the map we might get by the finale. Oh, Bronn. When will you admit how much you love saving Lannisters, money or no? Randyll and Dickon Tarly rose to prominence and death with equal speed; I’d guess in service of fueling Tyrion’s doubts more than anything. Question is – will they lead anywhere? Cersei’s pregnancy is an interesting wrinkle into presumptions she’d be irrelevant after Season 7. So … Drogon’s already healed, then? Jerk move of Bran to send all ravens to spy on the Night King, and immediately tell the Maester they’ll need more to send messages. Oh, what could have been if Arya went to King’s Landing after all, and make a quick trip through Fleabottom. Earnest question – how does Sam know he got all the relevant scrolls he’d need? 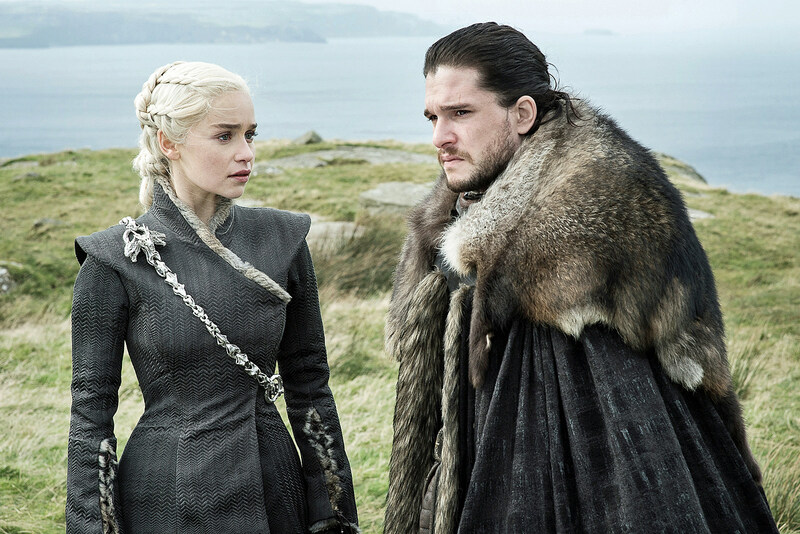 Source: Review: ‘Game of Thrones’ ‘Eastwatch’ Brought Reunions, Returns and Rowing, Oh My!